This is a report on the first four years of a five year macrofungal inventory of Haida Gwaii carried out by a team of mycological specialists. It details the areas visited in the first four years (60), and the number of fungal collections made (almost 1800), the number of fungal taxa recorded (479), and some biogeographical aspects of the information gathered. The importance of fungi to the biological communities of the islands is discussed; for without the symbiotic and saprobic activities of fungi, there would be no forests. A full inventory of macrofungi will be a long-term project and significant new information will be accumulated with each subsequent year of field work. Haida Gwaii, or the Queen Charlotte Islands archipelago, has been the focus of studies on the biogeography of many groups of organisms. Studies of vascular plants (Calder & Taylor 1968, Taylor 1989), mammals (Foster 1965, 1989), insects (Kavanaugh 1989, 1992) and Bryophytes (Schofield 1989), have established the archipelago as having several endemic and interesting disjunct taxa. The macrofungi, which are a conspicuous and ecologically important component of the biota, remained largely unstudied until 2003, when we commenced a survey of the macrofungi of Gwaii Haanas National Park Reserve and Haida Heritage Site. Previous studies of fungi on Haida Gwaii focussed on disease and decay organisms of economically important tree species. During the early 1940s intensive studies were conducted by J. E. Bier and R. E. Foster on decay fungi of Sitka or aeroplane spruce, at the time a vital wartime material. During the 1950s Bier, Foster, Pilsbury and Ziller studied decay and disease fungi of western hemlock in addition to Sitka spruce. The DAVFP herbarium housed at Pacific Forestry Centre in Victoria BC currently holds somewhat more than 900 collections from the Queen Charlotte Islands. The vast majority are disease and decay fungi from these studies. M. J. Peterson, R. Outerbridge and John Dennis 2000 studied chanterelle productivity on burned and unburned regeneration sites in the vicinity of Skidegate Lake on Moresby Island, and in the process documented 79 species of macrofungi. 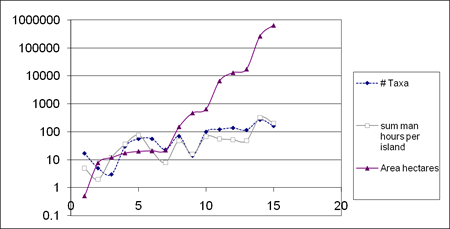 All records are from the last week of September 1999 in four study sites. Cantharellus formosus. Photo by Bryce Kendrick. S. A. Redhead collected material from the Queen Charlotte Lowlands of Naikoon Provincial Park on Graham Island during September of 1982, by his account a dry season. In Macrofungi of British Columbia: Requirements for Inventory 1997 Redhead listed seven species from his study that he considered as rare. These are: Coprinus phaeosporus, Hydnellum geogenium, Mycena paucilamellata, Phaeogalera stagnina, Psathyrella ammophila, Rhodocybe trachyspora var. vinacea and Stereopsis humphreyi. The commercial harvest of wild mushrooms was studied by S. Tedder, D. Mitchell and R. Farran in Seeing the Forest Beneath the trees: The Social and Economic Potentail of Non-timber Forest Products and Services in the Queen Charlotte Islands/ Haida Gwaii. 2000. Field observations from September 1999 indicated that it was a poor season for chanterelles but good for Boletes. The only macrofungi species noted as commercially harvested in Haida Gwaii were listed as king boletes Boletus edulis, Pacific golden chanterelles Cantharellus formosus, chicken of the woods Laetiporus sulphureus, blue chanterelles Polyozellus multiplex and pine mushrooms Tricholoma magnivelare. “Fungi play fundamental roles in nutrient and energy dynamics, and our lack of knowledge about them is appalling.” Jim Pojar 1993. 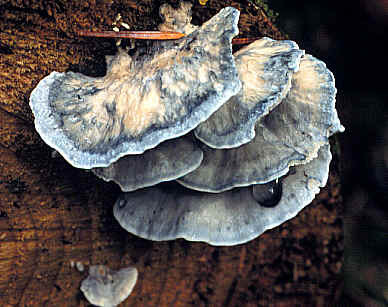 In 2003 an inventory of Gwaii Haanas macrofungi was initiated to create baseline data of Haida Gwaii macrofungi. Five field trips each of ten to fourteen days duration were conducted over four years, during which some 60 locations were sampled, 38 in Gwaii Haanas National Park Reserve and Haida Heritage Site. In 2003 and 2004 Paul Kroeger, Bryce Kendrick, Clint Kendrick and Judson Brown conducted all collecting activities. In 2005 Adolf Ceska and Oluna Ceska joined our team, in 2006 Oluna Ceska and Christine Roberts participated. Within Gwaii Haanas National Park Reserve and Haida Heritage Site all sites were boat accessed with the exception of September 14 2004 when helicopter transport allowed a brief sampling of the Alpine Tundra (AT) and Mountain Hemlock (MH) zones of the San Cristobal mountains. All sites sampled by boat access are in either the very wet hypermaritime Coastal Western Hemlock (CWH vh) or wet hypermaritime Coastal Western Hemlock (CWH wh) subzones. Collection locations are presented in this PDF. The time spent searching in a given site varied from a half hour on small islands or sites of limited habitat to 4 hours in large sites, with an average of about 2 hours per site. An example of disproportionate search effort for limited area was inadvertently provided by Ellen Island data. The Ellen Island warden cabin is the base for research conducted in the southern portion of Gwaii Haanas National Park Reserve and Haida Heritage Site. When storms rendered boat travel unsafe we were confined to the island and therefore sampled it heavily. Voucher samples of most taxa found at each site were preserved. Specimens collected in the field were individually wrapped and batched by each site visited that day. Many fungi were photographed in situ and many collections were photographed before preservation. Upon return to the base camp, either Ellen Island or Huxley Island warden cabins, material was processed in chronological order by a triage system. Data labels were prepared for those samples confidently identified in the field which were immediately dehydrated. Samples which required verification with available literature and simple microscopy were next annotated and dehydrated and then problematic samples were described and annotated, photographed and preserved. Amanita francheti. Photo by Bryce Kendrick. Accumulated dried labeled voucher specimens were packaged in batches by date and collecting site and returned with the researchers for further preparation. Unique collection catalogue numbers were assigned to the vouchers and determined collections were deposited in The Herbarium of the Botany Department of the University of British Columbia (UBC) or the Haida Gwaii Museum (HGM). Collections not yet determined were retained for further examination and research. Collections were distributed among the researchers according to special interest and expertise for further research, thus Oluna Ceska worked especially on Inocybe, Galerina, Mycena and Entolomataceae such as Leptonia and Nolanea ; while Christine Roberts took on the collections of Russula, a particularly large and important genus, as well as other taxa. Other samples will be sent to other specialists, for example the hypogeous sequestrate truffles and false-truffles have been sent to Dr. James Trappe of Corvallis OR who is expert in these. How Complete is this Inventory? Over the past 4 years, we have made almost 1,800 collections. Surveys of plants and animals can approach completeness in a reasonable time frame. This is not true of fungi, as we will explain. We have observed that a large number of previously unreported species were added to our survey results in each of the past three years. * As of December 2007 the taxa total was revised to 479 after a more thorough review of vouchers in the lab. Further determinations continue to modify our inventory. We found a similar pattern of continuously emerging novelty in a 5-year study of macrofungi which we carried out in Clayoquot Sound (Roberts et al. 2004), recording about 100 additional species each year. Other authors have documented similar patterns over much longer periods. Tofts and Orton (1998) found previously unreported species in every year of a 21-year study in Scotland. Straatsma et al. (2001) collected in a specific location in Switzerland for 21 years. Only 8 species (2% of the total) were found every year, and even in the last year of the study 19 species appeared which had not been seen previously. 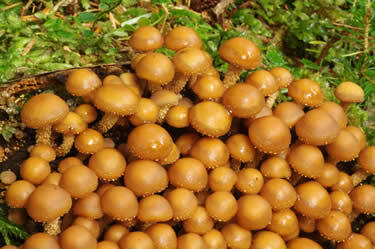 The Cascade Mycological Society in Oregon collects taxonomic data in conjunction with their annual mushroom show. After 16 years they had found a total of almost 700 species, with about 300 species being collected each year. Of the 700 total, only 37 species (5.5%) were found in all 16 years, while 190 (28.3%) were recorded in only one year (Kendrick 2005). The evidence above shows unequivocally that the fungi of any given area cannot be fully enumerated over a short time frame. Why is this? It is because for most of their lives most fungi grow hidden within their substrates, whether these be soil, the roots or trunks of trees, or a variety of plant or animal debris. During this time, they are slowly breaking down their substrates with enzymes, and gradually accumulating food. 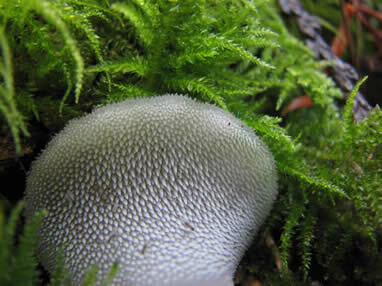 During this often extended phase, fungi do not produce any structures that would enable us to identify them visually. When will they show themselves? A few do so every year, many produce fruit bodies more sporadically, and many will fruit only once in many years. The actual emergence of fungal fruiting bodies depends on three main factors: (1) The weather: some years are too dry, others are too cold. (2) Accumulation of energy: it takes a lot of food reserves to produce a crop of mushrooms, and these reserves may take years to accumulate. (3) The relative success of any given fungus in the face of competition for space and nutrients by other fungi and organisms from other groups. Some fungi are also associated with natural or anthropogenic disturbance events such as fire or exposure of mineral soils, which will occur at irregular and unpredictable intervals. These issues are not unique to the fungi, but they do prevent us from discovering many taxa in the short term. It is estimated that a survey of the kind we are doing would require 25-30 years for the compilation of a more or less complete catalogue of fungal biodiversity. Above are listed just over sixty macrofungi that are conspicuous and frequently found during our study. Several are notable as species infrequently encountered elsewhere or considered rare: Clavulina castaneopes var. lignicola, Cyphellostereum laeve, Gymnopilus punctifolius, Humaria hemisphaerica, Hygrophorus marginatus var. olivaceus, Hypholoma myosotis, Mycena amicta, and Stereopsis humphreyi. Psathyrella ammophila. Photo by Adolf Ceska. What Rare Fungi have we found? No formal “red list” or rare fungus tracking list exists for BC, though Scott Redhead proposed such a list in 1997. The US Forest Service created a list of macrofungi considered of concern in management of old-growth forest habitat. Redhead S. 1997. Macrofungi of British Columbia: Requirements for Inventory. B.C. Ministry of Forests Research Program Working Paper 28. Kuehneromyces mutabilis (syn. 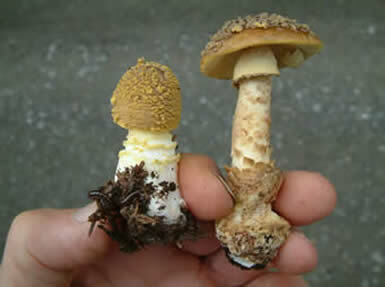 Pholiota mutabilis). Photo by Adolf Ceska. FEMAT listed species on Haida Gwaii. Anonymous. 1994. Standards and Guidelines for Management of Habitat for Late-Successional and Old-Growth Forest Related Species within the Range of the Northern Spotted Owl. Attachment A to The Record of Decision for Amendments to Forest Service and Bureau of Land Management Planning Documents Within the Range of the Northern Spotted Owl. Castellano, M. et al. 1999 Handbook to Strategy 1 Fungal Species in the Northwest Forest Plan. USDA Forest Service PNW-GTR-476. Castellano, M. et al. 2003 Handbook to Additional Fungal Species of Special Concern in the Northwest Forest Plan. USDA Forest Service PNW-GTR-572. Pseudohydnum gelatinosum. Photo by Bryce Kendrick. 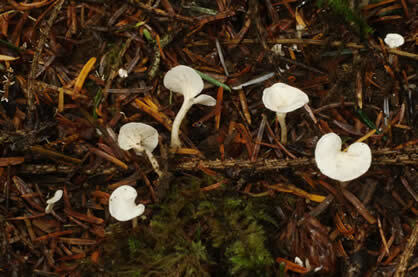 Biogeography of Gwaii Haanas Macrofungi. and the parasitic microfungus Puccinia pimpinellae ssp. carlottae in Savile in Calder & Taylor 1968 p. vi. Savile considered a parasitic microfungus on Crowberry Empetrum nigrum L., Exobasidium empetri S. Ito & Otani, to be a significant disjunct providing evidence of glacial refugia in the archipelago. (ibid.). Islands always have fewer species than nearby mainland. There are unfortunately no data on macrofungus diversity of the adjacent Mainland coast therefore no comparison is possible. Certain tree species, some of which are important mycorrhizal fungi host trees, are not naturally occurring in Haida Gwaii; these being cottonwood Populus balsamifera ssp. trichocarpa, true firs (Abies amabilis, A. grandis and A. lasiocarpa), birch (Betula papyrifera), Rocky Mountain maple (Acer glabrum), bitter cherry (Prunus emarginata), Cascara (Rhamnus purshiana) and Douglas fir (Pseudotsuga menziesii). Some of these have been introduced in recent times Turner 2004. The list below does not include mycorrhizal macrofungi considered specific to trees not occurring naturally in the study areas. Some fungi taxa were conspicuously lacking after three years of collecting. Albatrellus flettii. Photo by Judson Brown. ** Leccinum spp. Red capped Leccinum are reported by residents from stabilized dunes on Graham Island. *** Ramaria spp. Several Ramaria were encountered in 2006 on Burnaby, Graham and Lyell Islands. The smaller the island, the fewer the species. During the four years of this study, several islands of different sizes were sampled. 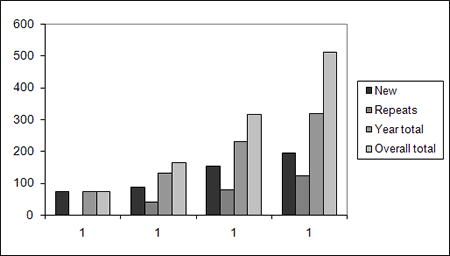 Our results appear to show more correlation of search effort, rather than island size, to number of taxa documented. This may indicate that longer term intensive studies on a size range of selected islands could eventually show some correlation of species richness with island size as shown in other groups of organisms. Redhead, S.A. 1988 A biogeographical overview of the Canadian mushroom flora. Can. J. Bot. 67: 3003-3062. Tyromyces caesius (syn. Oligoporous caesius). Photo by Bryce Kendrick. c. 21,000 Glaciation maximum .Nunataks, coastal headlands and exposed continental shelf remain partially ice free. c. 10,000 Rapid warming signaled by appearance and expansion of western hemlock mixed with spruce, few pine. 2500 – 600 Western hemlock, sitka spruce, western redcedar and lodgepole pine and alder are common trees, true fir (Abies) absent. 600 – 150 Cooling and some sea level lowering in “Little ice Age” ? 150 to present CWH vh, CWHwh, MH and AT biogeoclimatic zones in Gwaii Haanas, temperatures and sea level rising. True fir (Abies) absent. Barrie, J.V. et al. 2005 Late quarternary geology of Haida Gwaii and surrounding marine areas. In Fedje & Mathewes 2005 pp. 7- 20. Lacourse, T. & R.W.Mathewes 2005 Terrestrial paleoecology of Haida Gwaii and the continental shelf: vegetation, climate and plant resources of the coastal migration route. In Fedje & Mathewes 2005 pp. 38- 58. Mathewes, R.W. 1989. Paleobotany of the Queen Charlotte Islands. In Scudder & Gessler eds. The Outer Shores. pp. 75- 90. 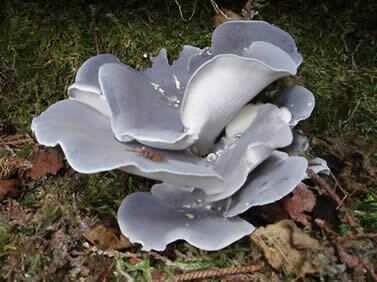 As of August 2007 this study has documented 512 species of macrofungi for Haida Gwaii. Roberts et al. 2005 found 551 species in five years study of Pacific Rim National Park Reserve. 970 species are listed for Vancouver Island in Matchmaker data Ian Gibson 2001. Note that Matchmaker has now been brought online in E-Flora BC as the Fungi component of E-Flora, and atlas pages for all species are now available. This public access web page is made possible through the funding and support of Gwaii Forest Society (GFS), Parks Canada, and Gwaii Haanas National Park Reserve and Haida Heritage Site (GHNP). We especially want to thank Norm Sloan (GHNP) for initiating the study of Gwaii Haanas fungi, and Lana Wilhelm (GFS) for enthusiastically expanding our study to the entire archipelago of Haida Gwaii in 2008. Howa. Clint Kendrick and Judson Brown were of invaluable assistance and support during field work in Gwaii Haanas and their eagle-eyes found many intriguing specimens. Howa.